During the 15th edition of Auto China 2018, one of the world’s leading motor shows, Valeo lifted the veil in Beijing on innovative solutions to improve the air quality inside car cabins. Until everyone drives an electric vehicle, breathing in polluted air will, sadly, remain part of car commuters’ daily routine, especially in China’s largest cities. 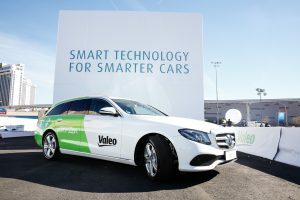 Valeo, a world leader in cabin air filters, used its OXY’Zen demonstration vehicle to showcase its new range of automated cabin air purification solutions. Connected to sensors that analyze the air quality inside and outside, Valeo’s air purifier conveys the information in real time via a human-machine interface and adapts the air in the cabin accordingly and effectively. Its revolutionary new filter, made from tight-knit reinforced fibers, filters out 98% of ultrafine particles and toxic gases. Hay fever sufferers will appreciate the fact that they can also neutralize up to 96% of pollen allergens. For extra comfort, Valeo’s high-performance ionizer cleans and deodorizes the cabin while its Valeo AquAIRius® mister instantly refreshes rear passengers.